Acute myeloid leukemia (AML) is a genetically and clinically heterogeneous disorder featured by the incomplete maturation of hematopoietic stem cell and the reduction of normal blood counts . Despite great efforts have been made in new therapy development, chemotherapy with cytarabine and anthracycline remains the current treatment protocols in AML, which conduct complete remission (CR) rates of 70–80% . However, more than half of adult patients and around 80% of elder patients develop into primary refractoriness, relapse, or treatment-related mortality . In addition, tremendous individual variability in prognosis varies greatly among patients: 5-year survival varies from 18 to 82%, and relapse rate varies from 33 to 80%, which can be partly explained by disease subtype, age, somatic mutations, gene expression abnormalities, and other molecular alterations. Genetic variants in those, such as in NPM1, FLT3-ITD, CEBPA, WT1 have been verified to be marks of prognosis [4–6], however, these factors can only explain part of individual variants for AML. 579 Chinese Han patients were recruited from the Department of Hematology of Xiangya Hospital from May 2009 to December 2017. All patients were diagnosed and classified based on the FAB criteria. The exclusion criteria were (1) M3 subtype, because of its specific treatment and outcomes. (2) Patients with serious diseases or other cancers, secondary leukemia and those with missing data (e.g. cytogenetics or molecular abnormalities). (3) Patients failed to follow-up were eliminated in this study. The detail therapeutic protocols were described elsewhere [17–19]. Complete remission (CR) was used to assess drug response. CR was defined according to the international recommendations, including no clinical presentation of leukemia, no evidence of extramedullary disease, bone marrow blasts < 5%, neutrophils counts > 1.0 × 109/L, and platelets counts > 100 × 109/L after chemotherapy . Overall survival (OS) and relapse free survival (RFS) were used as disease outcomes and events were defined as any relapse or death in agreement with the criteria as previously described. All survival end points were censored at the date of last follow-up when relapse or death was not observed . The SETD2 gene encodes a 230 kDa protein that is non-redundantly responsible for trimethylation of lysine 36 on histone H3 (H3K36me3), a critical mark that is involved in various important cellular processes such as transcriptional elongation, alteration splicing, mismatch repair regulation and homologous recombination repair [22–27]. Recently, SETD2 was identified as tumor suppressor, as loss-of-function mutation with SETD2 has been discovered in various tumors, including ccRCC, lung adenocarcinoma, gliomas, AML, ALL, and mastocytosis [12, 28–32]. 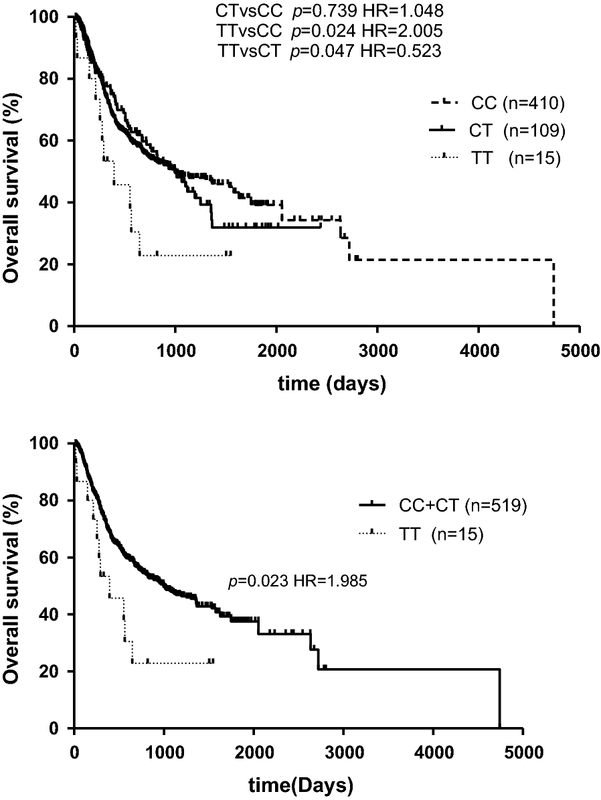 In addition, loss-of-function mutation in SETD2 and/or decreased H3K36me3 levels have been linked to poor clinical prognosis in lung cancer and ccRCC [15, 33]. In AML, SETD2 mutations are recurrent events and are associated with chromosomal abnormalities that are known to be driver mutations in leukemogenesis, such as MLL-rearrangement . In the presence of chromosomal translocation, such as MLL-rearrangement, knockdown of SETD2 promotes initiation as well as progression of tumor by expediting the potential of self-renewal of leukemic stem cell . Notably, under normal hematopoietic condition, SETD2 is required to maintain self-renewal capability of hematopoietic stem cell, SETD2-deleted HSCs gives rise to malignant transformation eventually . Consistent with our findings, SETD2 rs76208147 TT genotype indicates worse prognosis of AML patient, which underlying mechanism warrants further investigation. 12967_2019_1848_MOESM1_ESM.docx Additional file 1: Figure S1. Position of three SNPs in SETD2. 12967_2019_1848_MOESM2_ESM.docx Additional file 2: Figure S2. eQTL analysis of SETD2 polymorphisms. 12967_2019_1848_MOESM3_ESM.docx Additional file 3: Table S1. Multivariate Cox regression analysis of clinical characteristics impacting AML OS. 12967_2019_1848_MOESM4_ESM.docx Additional file 4: Table S2. Unconditional logistic regression analysis of clinical features related to non-CR risk in AML.